Now that I have an actual copy of the "Pick Of The Week" in my hands, I have to say, it is no longer my "Pick Of The Week." Still a great little package, Thin Lizzy's "Live & Dangerous" is NOT a remastered version of the classic live LP. It is a DVD that features a remastered version of the Rainbow Theatre concert from 1977, which, to add further confusion, is NOT where the classic live LP was recorded. That recording can be found on a stellar bootleg called "Live From the Tower Theatre." And by the way, the bootleg features the entire unedited performance. 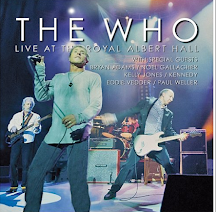 According to the liner notes in this new DVD, this classic live release is hardly live. Producer Tony Visconti states that Phil Lynott insisted that his vocals, and some flubbed bass lines, get fixed in the studio. Guitarists Scott Gorham and Brian Robertson became jealous, and wanted to fix their mistakes, as well. According to Visconti, "The only thing that is live is the audience and drums." THIN LIZZY-LIVE AT THE TOWER 1977. The sad part is that I kinda knew most of this. Sorry.